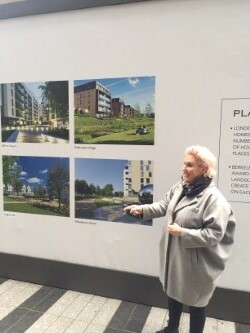 In coining the term ‘gentrification’ in reference to the London housing situation in the 1960s, the sociologist Ruth Glass highlighted the precarious situation of working class Londoners, displaced by rising property prices and a lack of housing stock. The working class community of Whitechapel today faces similar challenges, as do other communities across London. Swept up in the waves of contemporary developments, yet dispossessed of the capital means to fully participate, they face an increasingly uncertain future. As the process of gentrification spreads across London, housing prices and rents steadily ascend, forcing many who have lived in areas for generations to relocate or exist in an insecure state of precarity. 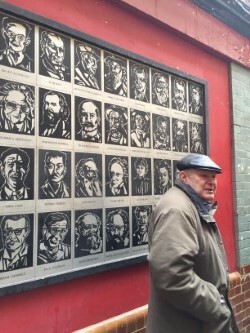 The astonishing rate of gentrification in Whitechapel, East London, was illustrated to our ‘Class, Politics and Culture’ course cohort on a recent LSE Sociology field trip, led by Dr. Lisa McKenzie and Martin Wright, an individual who has lived in the area since 1994 and is a working class activist. The working class history of Whitechapel is a rich and colourful one, marked by numerous key historical landmarks. The area has seen the birth of trade unions and political movements, including notable anarchist ones, a symbol of which is the mural of anarchist figures that can be found on the wall adjoining the Freedom Press bookshop in Whitechapel. The Press itself was started in the 1880s, testament to the call for a free press that was open to working class political views. Historically, the Whitechapel area has held some of the highest rates of homelessness and poverty throughout the UK. That remains true to the present day. However, it is also an area that is witnessing one of the fastest rates of development across London. Situated in close proximity to the financial district of central London, and adjoining fashionable Shoreditch (itself a site of rapid gentrification from the 1990s onwards), Whitechapel is being appropriated as prime land for the construction of high-rise apartment and office buildings. At average prices of £1m plus, the apartments that are rapidly colonizing the area are priced far beyond the means of many Whitechapel residents, a great number of whom subsist on income in the region of the minimum wage. In common with many new developments in London, residential sales are being marketed not solely at wealthy Londoners, but significantly, overseas investors. The rapid acceleration in housing value in the area means that overseas buyers are not incentivized to rent out flats that they may not occupy themselves. The annual increase in value of the flat itself means that they need not even bother renting out the property, so many do not. This ‘lights out’ state of affairs co-exists alongside the high rates of homelessness in Whitechapel, as it does in many areas across London. on the main road, well-presented and smart, is for the majority of apartments. The second, located down a side alley, in a state of disrepair and more akin to a ‘tradesman’ entrance, is the doorway to the apartments for those from lower socio-economic backgrounds. In this building, lines are drawn and divisions created that are not simply symbolic but physical also. The marketing renderings that serve as advertisements for these apartment blocks serve as illustrations of the kind of sanitized ‘utopian’ ideal that this gentrification moves towards. The images created are of residential areas where predominantly white, middle class professionals are represented as inhabitants. There are very few representations of anyone of colour, nor of disabled individuals or children, for example. These imagined spaces in the renderings are becoming mirrored in the spaces surrounding these residential buildings. One example of these is Goodmans Fields, a square which is located in the middle of a series of adjoining buildings. Policed by security guards, if local people not fitting the demographic that the new developments advocate (white, middle-class professional) try to spend time in the square, they will be asked to move on. In a recent incident, a father came to the square and his children began playing in the water fountain. A security guard asked him to move on but he resisted, asking that his children were allowed to play in the water. The police were subsequently called and he was arrested for refusing to move his children away. This example of literal violence is paralleled by an example of symbolic violence, in this case in the history of the site. Goodmans Fields was traditionally a place where the working horses were stabled. In an attempt to endow the newly built area with heritage and historical context, the housing developers have appropriated this chapter of local working class history, by placing idealized equine sculptures at the centrepoint of the square. Dispossession takes on another dimension in this case, whereby exclusion is illustrated on economic, social, cultural and symbolic grounds. A further example of symbolic violence being exercised is the Jack the Ripper Museum, located on Cable Street. When the proposal for this museum was put forward, it was described as a museum commemorating women’s rights history of the East End. It was only post construction that the museum was revealed as being dedicated to the notorious serial killer. Thus the ‘commemoration’ of working class women’s history took the form of detailing their apparent alcoholic addictions, further disempowering the females who fell prey to the infamous murderer. The museum serves as another example of symbolic violence in appropriating working class history, rendering it into a vapid site of touristic fodder. The magnificent Cable St Mural in Shadwell commemorates the anti-fascist struggles that have taken place in the East End, particularly that of 4th October 1936, when a mass of 300,000 anti-fascist protestors stood together, erecting barricades against the marching Blackshirts of Oswald Moseley’s British Union of Fascists. Despite attempts of the police to displace these barricades, the BUF Blackshirts were forced to relocate their march to central London. Although there have been obstructionist and vandalism attempts over the decades since the mural was started in 1976, it stands in very good condition today, marking a striking and monumental tribute to the stalwart anti-fascist movement. cultural capital appears bleak. It seems likely that the rate at which they are forced to relocate shall only continue to increase. Such is the case across London, as so-called ‘social cleansing’ appears to be on the rise. Whilst activist groups such as Focus E15 lobby for the housing rights of those that are at times forcibly relocated to areas far outside of London, without significant changes in government policy regarding new developments and council housing, it seems likely that the social landscape of Whitechapel and similar areas shall be increasingly monocultural in years to come.